Tannins may be helpful for their antiviral, antioxidant and antimicrobial effects, according to an article published in "Molecular Nutrition & Food Research" in September 2009. However, these plant compounds may also trigger migraines in some people for whom a tannin-free diet may be beneficial. It may be difficult to totally avoid tannins, as these polyphenols are found in so many different nutritious plant foods and beverages, but you can minimize your intake once you understand the main sources of this antioxidant. Getting most of your protein from meat, poultry, seafood and dairy products can help you minimize your tannin intake. Plant-based protein sources often contain tannins. Legumes containing tannins include black beans, kidney beans, pinto beans, black-eyed peas, chickpeas and lentils. Cashews, hazelnuts, almonds, peanuts, walnuts, pistachios and pecans also contain some tannins. Sorghum, barley and corn are also sources of tannins. You can limit the tannins in your diet by choosing other grains or pseudo-grains, such as wheat, oats, rice, spelt, amaranth, bulgur, millet or quinoa. Pay attention to the ingredients lists of whole-grain products to make sure corn, sorghum or barley aren't included in the mix. Tannins are what give certain raw fruits an astringent, or bitter, taste. Most of the tannins are found in the skin of fruits and fruits that aren't as ripe, so choosing very ripe fruit and avoiding the skin can help you limit your tannin intake. 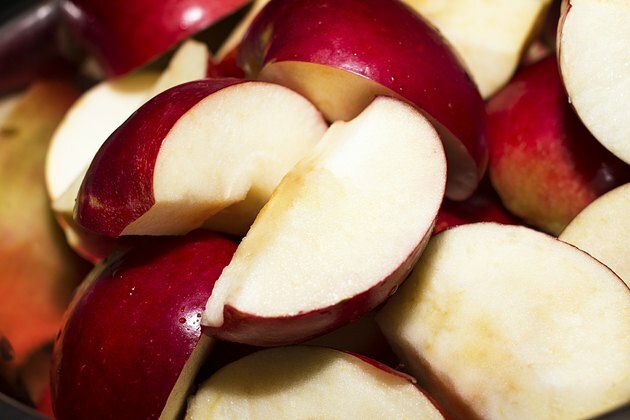 Apples are one of the largest sources of tannins in the American diet, according to a study published in "The Journal of Nutrition" in 2004. Blueberries, blackberries, strawberries, raspberries, cranberries, cherries, pineapples, lemons, limes, oranges, grapefruit, guava, cantaloupe and honeydew all contain tannins. Mangoes, dates, kiwis, nectarines, peaches, nectarines, pears, apricots, plums, bananas, avocados and pomegranates are also sources of tannins. Vegetables aren't as likely to be high in tannins, although squash and rhubarb can contain these substances. Beer, wine, tea, fruit juices and cider can all be sources of tannins, so you'll need to avoid these if you follow a tannin-free diet. Milk, water and coffee are better beverage choices if you're avoiding tannins. Chocolate also contains tannins, and you'll get some tannins if you season your food with cinnamon or curry powder. This still leaves plenty of herbs and spices to choose from to flavor your food.